Golf del Sur is a holiday resort in the south of the Canary Island of Tenerife and just fifteen minutes drive from the main Reine Sofia Ariport. The resort is just a short drive away from both los Cristianos and Playa de las Americas. The resort is aimed particularly at golfers and has a number of golf courses for visitors to use, one of the courses is a twenty seven hole course for championship golf. Golf del Sur resort has a collection of four and five star hotels for guests to stay in , there is also a choice of holiday apartment blocks and villas for those people who prefer a self catering holidsy. There are plenty of bars and restaurants for visitors to enjoy at Golf del Sur and there is also a small commercial centre for guests to enjoy. Visitors who want to enjoy a hectic night life scene will find it at the neighbouring resort of Playa de las Americas. For those people who have a passion for playing golf, the Golf del Sur resort is an ideal spot for a holiday. Tenerife is a volcanic island, although there has been no erruptions in years and the green of the golf courses is set against the background of the volcanic, grey landscape. Golf del Sur is proud of the first class accommodation that it offers visitors and there is every amenity that visitors could want. The resort contains restaurants that are noted for the quality of food and service that they offer. Even if golf is not your game you can still enjoy the amenities and tranquil atmosphere that the resort offers its visitors. 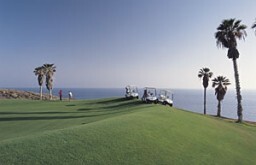 Golf del Sur offers a wide range of activities including tennis and crazy golf. The coast around the resort is rocky but the nearby resorts of los Cristianos and Playa de las Americas offer some great beaches and a lot of water sports, including scuba diving and water skiing. When you tire of activities you can enjoy some people watching from one of the many pavement cafes that line the palm tree shaded streets and walkways. There is plenty of opportunity to explore the rest of the island if that is what you want to do, or you can just enjoy the weather and the laid back atmosphere that the resort offers its visitors. There are plenty of trips round the island and you can see the National Park, as well as water parks and a wildlife park. There is a small commercial centre where you can get some shopping, including tax free goods such as perfume, electrical goods and cigarettes. There are plenty of cafes so if you want to sit and rest your legs for a while before you continue your shopping there is a good deal of opportunity. If you want designer goods then the nearby resort of Playa de las Americas has a lot to offer in the way of up market and specialist shops.